I would like to wish all my visitors a very Happy New Year full of lots of creativity. I had a very enjoyable Christmas and was lucky enough to receive some fabulous crafting goodies from my nearest and dearest. Lots of rubber stamps to create my own backgrounds and a few cute images from Stamping Bella. I also received a few Martha Stewart punches that I have been itching to buy for some time now, distress inks to add to my growing collection and beautiful papers. I especially like receiving paper because it is usually designs I wouldn't buy myself so provides me with a greater variety to chose from when making a card. Since Christmas I have been suffering from a very nasty cold which has managed to restrict my daily routines and all I have wanted to do is lay down. New Years Eve was spent laying on the sofa watching rubbish on TV. Sods law when its the one time of year I get a few extra days off of work and was looking forward to crafting. January is a busy time for card making as I have so many family and friends cards to make. I have made my first easel card, in fact I have made two but the other one will be showcased on Tuesday when the next Everybody Art Challenge is revealed. This card is for my Mum as it will be her 70th birthday this week. 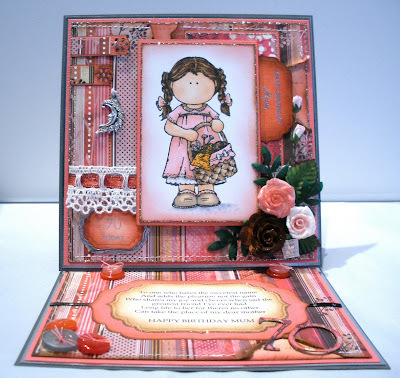 I am entering it into this weeks challenge over at Charisma Cardz, the theme is Celebrations. Fabulous card.Love the colour combo. Thanks for playing with Charisma this week. 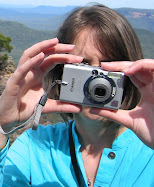 Good luck with the blog hop. Happy New year!! Stunning card, such wonderful details. Se is adorable and I love your stunning paper and detail! Hope you feel better soon happy new year! Wow...what a great card!! I simply love what you have made...fantastic!! A stunning Fabulous card. 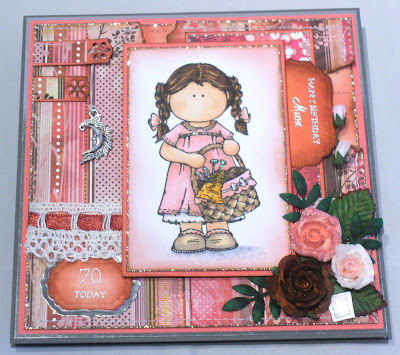 Thank you for joining us at our Charisma Cardz Birthday Blog Hop Challenge. Oh gorgeous card - really beautiful!